Client: Ministry of "by, bolig og landdistrikter"
Station cities is a research project that takes point of departure in the smallest previous or present station cities. A lot of the cities struggle to maintain a lively city center with shops and attractive housing. In many cases, the city experiences a “doughnut effect”, where the center of the city is empty and dead, but the outskirts are well functioning and with a suburbia feel. Throughout the project we investigate these cities. We look into any possible patterns, both geographically and in relation to the distance between the station city and the nearest bigger city. These patterns tell us that some cities will go from being its own city, to grow together with bigger cities and transform into suburbs. Other cities will maintain their status as a smaller, but well-functioning city, and some will slowly dissolve. For each scenario, we create different visions of how the city can develop and adjust to the future. To create different scenarios it was necessary to do vast and complex study of all the station cities, Its infrastructure and development potential. With the insight from the study, we create several scenarios for each station city. The empty building along the main street are gradually demolished down and the land is given to the neighboring building (this is possible through municipal funding). This way, the plots are transformed into larger ones and the owner can choose to keep their building or build a new villa, further from the road, in order to avoid traffic noise. If there is too many empty plots close to each other, they are transformed into a public park. This scenario can be undertaken ad hoc and it is dynamic. The main problem in station cities today is primarily their center around the main street with abandoned building in poor condition. 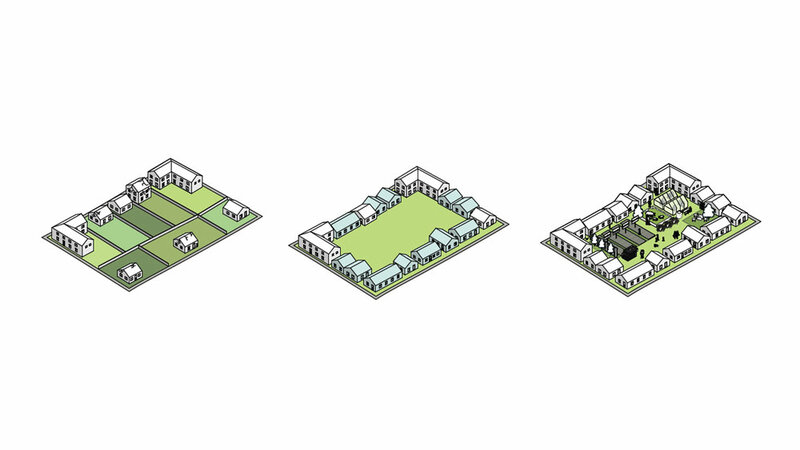 In this scenario, the center is abandoned in its existed formed - all building are torn down and replaced by new, more up-to-date homes, that can attract new residents to the city. The layout would be set up with smaller streets perpendicular to the main street with terraced houses/row villas. This way, the houses are turned away from the noise of the main street and create a calmer environment for the homes and outdoor areas. 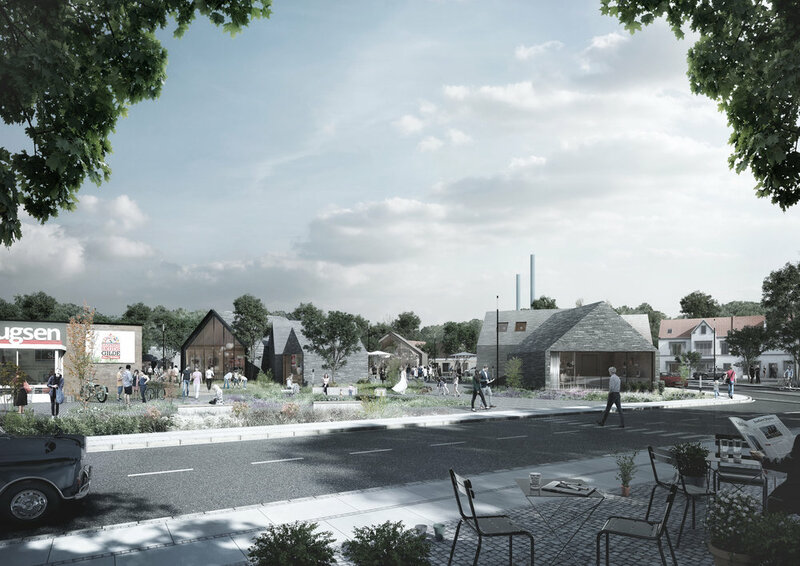 This scenario will typically occur in station cities close to a big city, where the station city's character changes to a suburb, instead of a city center itself. The density is preserved or even increased and the street is as beautiful as the old one. 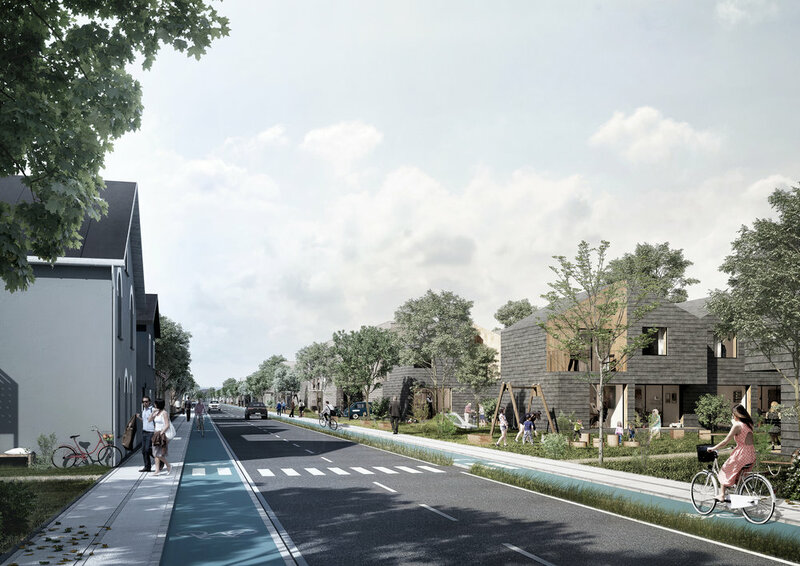 By creating the right housing typology, one can hope to attract prosperous families that can help revitalize the city and create life in the streets. The families with children appreciate the green areas, healthy lifestyle, slow living and the community. In this scenario, Villa blocks are the center of the station city, back to the original idea of settlements along the main street, like the new town model from the end of 1800s. The main streets are created by infill buildings, which transform the scattered settlement into a block of low villas. This creates a new topography called Villa blocks. The block is base on already existing buildings and their historical value. Existing building are renovated and left and the new infills are adapted to the station city.